A wedding in Moscow, the majestic and historic capital of Russia, is the perfect place to hold a fairytale celebration. Known for its art, music, history and architecture, Moscow is one of the world’s great cities, offering some of the most breathtaking scenery anywhere. Serviced by two major international airports, once your guests have secured a visa from their home countries granting permission to travel to Russia for your Moscow destination wedding, it is as easy to get here as it is to any other major metropolis. You can arrange accommodations in small private boutique hotels, familiar business class properties, or world-class hotel resorts. Some areas of Moscow are modern and cosmopolitan, while others are rustic and natural. While the winters are quite cold, the Russian people are known to be warm, friendly and more than anything, serious on the outside yet fun-loving to the core. As luxury Moscow wedding planners, we will handle all of the details for you, from creating an overall concept, to designing the perfect look to executing all of your plans so you enjoy a stress-free experience. We will match you with the perfect sites for each of your wedding events, from a welcome reception, to your ceremony and reception, and any post-wedding events you might desire. We will ensure that your guests are comfortable, safe and immersed in your unique wedding experience, enjoying the kinds of events that make memories for a lifetime. A weekend wedding in Moscow will give your guests the opportunity to visit the city’s iconic attractions between your events, including tours of St. Basil’s Cathedral, The Kremlin, The Bolshoi and Gorky Park. Moscow’s restaurants and café are renowned internationally for a wide variety of gourmet cuisine styles, and of course, the famous bars and night clubs offer the ultimate in entertainment. During our time together planning the perfect wedding in Moscow, we will help you incorporate the best of local culture along with details unique to you. Enjoy traditional Georgian cuisine one night to give your guests a purely Russian experience, while serving a five-course gourmet French meal worthy of royalty the next. As the center of Russian politics and culture, you’ll find that the best of everything, including art and entertainment is waiting for you here. Moscow wedding venues include dramatic hotel ballroom complete with crystal chandeliers and a hotel rooftop overlooking Red Square. 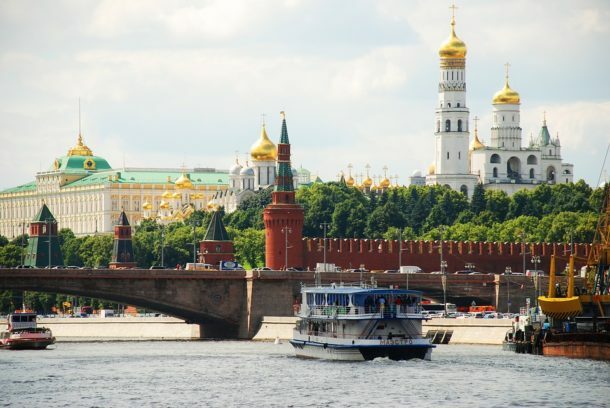 You could take an intimate river cruise through the city on a luxury yacht, or escape to the picturesque natural beauty of Moscow’s pine forest. Celebrate with your guests in a restaurant, in a café or at a riverside inn. There are few cities in the world as well-known and beloved as Moscow. If a Russian destination wedding appeals to you, contact our Moscow wedding planners today so we can begin planning your wedding adventure now and bring you one step closer to walking down the aisle in your own fairytale Moscow wedding.